Published on September 30, 2014 in Crime in T&T, General T&T, Media, People's Partnership, Politics and Security. 6 Comments Tags: Crime in T&T, Newsday, Politics, T&T Govt. ARMOURED vehicles similar to the Armoured Personnel Carriers (APCs) destined for use in TT next year are currently at the centre of a debate in the United States over the increased militarisation of the police there, in the wake of their reported use during the events at Ferguson, where police force provoked a national discussion about State powers and race. Published on September 21, 2014 in General T&T, People's Partnership and UNC. 22 Comments Tags: Kamla Persad-Bissessar, Politics, Raffique Shah, T&T Govt. When, last Monday, Chief State Solicitor (CSS) Christophe Grant distanced himself from a very political letter that was purportedly penned by him, the Office of the Prime Minister (OPM) hastily issued a statement saying that some official there had made a mistake by attributing the authorship to Grant. Published on September 21, 2014 in International, Religion, Security and USA. 1 Comment Tags: Middle East, Terrorism, USA. Much like Al-Qaeda, the Islamic State of Iraq and Syria (ISIS) is Made in the USA, an instrument of terror designed to divide and conquer the oil-rich Middle East and to counter Iran’s growing influence in the region. The fact that the United States has a long and torrid history of backing terrorist groups will surprise only those who watch the news and ignore history. Published on September 14, 2014 in Elections, General T&T, Parliament, People's Partnership and Politics. 19 Comments Tags: Kamla Persad-Bissessar, Larry Howai, Politics, Raffique Shah, T&T Govt. Nine out of ten people, if asked to comment on Government’s 2014-2015 budget, would quietly, and many grudgingly, say it was a good package. For the average citizen, what matters most in the annual Appropriation Bill are what new measures strip him (or her) of some portion of his earnings or wealth, meaning taxes or levies, and what new benefits accrue to him by way of increases in grants, subsidies, soft loans and so on. Published on September 9, 2014 in General T&T, Media, Parliament, People's Partnership, Politics and UNC. 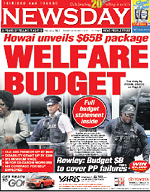 8 Comments Tags: 2014 Budget, Larry Howai, Newsday, Politics, T&T Govt. STATING Government is moving to safeguard the welfare of society, Finance Minister Larry Howai yesterday unveiled a record $65 billion budget. It contained increased benefits on a wide range of fronts, including pension enhancements which will affect more than 131,020 retired and self-employed persons, a new minimum wage, improved allowances for the disabled and easiser access to mortgages for more than 26,100 prospective homeowners. Published on September 7, 2014 in General T&T. Closed Tags: Caroni, Stephen Kangal. There would appear to exist in the North Caroni Area the basic building blocks including the most important that of unused land -space that can serve as the requisite triggers to launch the North Caroni Growth Pole as an aspect of regional development geared to spur growth in the domestic economy and employment.